Carpetgrass grows better on low, wet soils than other grasses. Carpetgrass is a perennial, coarse-leaved, creeping grass. It grows better on low, wet soils than do other grasses. It will grow well in either sun or shade but is less shade tolerant than St. Augustine and Centipede grass which it resembles. Carpetgrass may be planted by seed or sprigs. Carpetgrass is recommended only for lawns on wet, low fertility, acid, (pH 4.5-5.5) sandy soils where ease of establishment and care is more important than quality. Its chief disadvantage is rapid seedhead production. Carpet Grass makes a dense turf, can be grown from seed, shallow rooted and therefore is not drought tolerant. It is as cold tolerant as centipede and has poor salt tolerance. It's shade tolerance is about the same as Centipede (less than St. Augustine grass). Carpetgrass is a native grass to the interior Gulf states and similar tropical climates. Weeds and Bermuda grass can be crowded out by its thick sod. It is a good grass for erosion control and is a low maintenance grass on low fertility soils and can thrive if not mown without the addition of fertilizers. Carpetgrass is ideal for those slightly shadier areas when moist soil is present for long periods. It will withstand higher traffic than many other grasses with these conditions. It is similar to centipede grass in its cold tolerance. It does not tolerate salt. Good option for soil erosion control combined with low maintenance. Carpetgrass can be found from the sandy soils of East Texas to Florida and north to Virginia, Alabama and Arkansas. Carpetgrass is found in fields, woods, along roadsides, pastures and lawns. Also known as flatgrass, Louisianagrass and as "petit gazon" by the Creoles of Louisiana, carpetgrass is native to the Gulf Coast states and other tropical climates. It is a creeping, perennial grass that can be recognized by the blunt rounded tips of its leaves, flat stolons and a tall seedstalk with 2 branches at the apex. It forms a dense mat and will crowd out most other species. The ability of carpetgrass to thrive under low fertility makes it suitable for use on low maintenance areas such as parks, roadsides, airports and golf course roughs. Its most objectionable characteristic, frequentand prolonged production of seedstalks, limits its use on lawns. Frequent mowing with a rotary mower is required to maintain a nice looking carpetgrass lawn. Carpetgrass is susceptible to common soilborne diseases such as brown patch and Pythium and to most leaf spot diseases, but rarely do these diseases justify fungicide applications on carpetgrass. 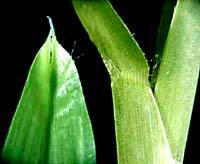 The grass usually recovers with little injury when environmental conditions change. The exception might be brown patch in the fall which can produce unsightly turf for several months. 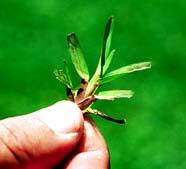 Where weeds are a problem in carpetgrass turf, the hormone-type herbicides can be used for broadleaf weed control. Also, most pre-emergent herbicides are safe on carpetgrass and can be used for crabgrass control.